Breathe. Our bodies are breathing all day long to keep us alive, but how aware of our breath are we? Bringing your intention to your breath is a powerful way to connect back to the moment and get into your body. If you're alive and reading this, your body is breathing. Thank you lungs! Yet, most people are not aware of their breath during the day. Your breath is the connection between your mind and body. By bringing awareness to your breath, you can breathe deeper and connect back to the present moment. Taking a few deep breathes is often what you hear when you are having a moment of panic. Yet, it really IS a powerful antidote to help calm down your nervous system. In yoga, pranayama is breathwork practice. Pranayama translates into "a force in constant motion." When you are moving with your breath - in life or yoga practice - you're connected and grounded. Bringing awareness and consciously working with your breath is one tool. One of my favorite pranayama exercises is alternate nostril breathing (Nadi Shodhan). It's a simple tool of alternating breathing in and out of each nostril, and it provides a deep sense of calm and relaxation in a few minutes of practicing. Another tool is letting your body breathe you. In restorative yoga or meditation, I can let go and let my body breathe me. Instead of forcing my breath, it happens naturally. It's an amazing experience of trust and appreciation in my body to know that it's always taking care of me - by breathing. In movement practice, especially yoga, you can let your movement be guided by your breath. Instead of forcing your body to go at a different pace, you can move based on your breath. Your movement will seem more fluid and connected, and you're tapped into this resource - your breath - to support you. "The oscillation of breathing is a perfect mirror of the fluctuations of life. Life is like a swinging pendulum, some changes bringing with them difficulties and pain and other changes bringing with them ease and joy. If we are open to this process, life will move us. If we are unable to integrate life's changes, we begin to resist by restricting our breath. When we hold the breath and try to control life or stop changes from happening, we are saying that we do not want to be moved. In those moments our desire for certainty has become much stronger than our desire to be dynamically alive. Breathing freely is a courageous act. What we discover is that our desire for stasis, our clinging to the life we know, and our bending of every situation to the security of our mental constructs are the very things that destroy our creativity and ability to live freely." Learn to breathe and be breathed. It will open up freedom in your body - and life. Use it as a mantra to remind yourself during the day - "Breathe." Breathe before meals. Practice mindful eating by taking 5 deep breaths before meals. It helps you connect to your "rest and digest" nervous system, eat slower (rather than rush your meals), and connect to your body to eat intuitively. Practice pranayama. Watch Kara Lydon (The Foodie Dietitian)'s video on alternate nostril breathing, and practice it a few minutes each morning. Breathe in your movement practice. Whether you practice yoga or any form of movement, focus on your breath at the beginning. Let your breath guide you and notice how your breath changes. If you're running or walking, you could match your breath to your pace. In yoga, you can breathe into each pose and move with the breath. 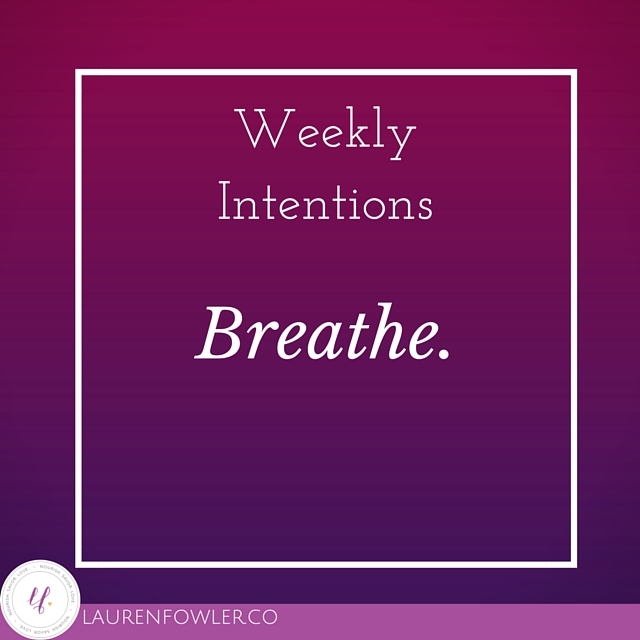 How are you going to use the intention of BREATHING in your life this week?